Alright, Mr. Sessions, it is time to put the Clintons and Barack Hussein in jail! Damaging America’s national security for personal gain is treason! While Robert Mueller’s presidential rectal exam has been proceeding full bore in the hopes of finding anything Russian, with the Democrats cheering at every turn, the real Russian collusion story is unfolding before our eyes. And the kicker is we have known about this over a year. And nothing has been done about it. Why, Mr. Sessions? Why hasn’t there been a special investigator named to pursue this? 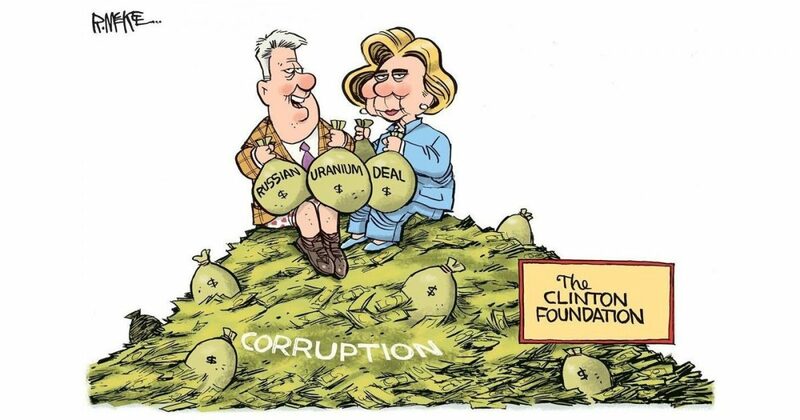 While Mueller and Comey were busy running interference for the Clintons in a vast conspiracy that involved money launderers, Russian operatives at the highest levels of the Kremlin, nefarious middle men, and America’s uranium supply, a significant portion of which found its way into Russian hands, the Clintons were busy raking in the rubles, to the tune of about $150 million. Mueller is now very busy investigating a story given to him by an anonymous source in a trenchcoat, selling counterfeit Rolex’s on Times Square, involving 9-year-old Donald Trump stealing a candy bar from a corner market when he was 9. The Uranium One conspiracy is about to blow up in the faces of the Clintons, Barack Hussein, Rod Rosenstein, Robert Mueller, James Comey, and many other complicit characters who allowed the criminal enterprise to exist, damaging America’s national security in the process. If Jeff Sessions doesn’t get busy prosecuting this, he is going to find himself going down the swamp drain with the rest of them. And THIS is what the Democrat Party has trotted out to deflect attention away from the facts (that’s right, much of the conspiracy to give away America’s national security for millions is now factual), a worn-out circus freak who looks more like a Hollywood lab creation, invented to traumatize children. It is Halloween after all. Get on this, Mr. Sessions! Prosecute them. It matters not their one-time political stature. The Clintons and Barack Hussein must answer to the same authority that We the People are required to answer to. End Robert Mueller’s witch hunt today! He and Comey are chin deep in the swamp and must also be dealt with. Enough beltway corruption already!